Every week, almost 2 million viewers tune in to watch Top Chef where chief judge (and executive producer) Tom Colicchio decides the fate of the young, aspiring chefs. The Emmy Award-winning show has made the lifelong cook a capital-C celebrity chef, complete with more than 400,000 Twitter followers. Today, though, Colicchio himself is cooking for the cameras, gliding around the kitchen at his New York restaurant Craft. This combination of technical skill, culinary creativity and ease in front of a camera has carried the 51-year-old chef to the top ranks of restaurateurs in America. And the bald-headed, guitar-playing, slightly bemused star is enjoying every step along the way. Wine Spectator's Harvey Steiman explains. 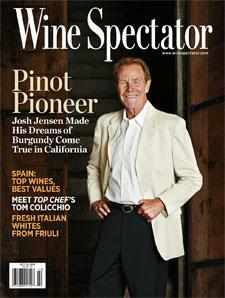 For the full article, check out the new issue of Wine Spectator, on newsstands September 17, 2013.